The move toward a countywide Transit Master Plan has so many moving parts (pun is apt) that it is easy either to get mired in details of a thread or alternately to have the eyes glaze so that the generalities are all that register. As AATA prepares to ask the City of Ann Arbor, the City of Ypsilanti, and Washtenaw County all sign on to a 4-Party Agreement which will begin the process of creating the new county authority and enacting the TMP, let’s just step back and look at the big picture of what the outcomes will be. 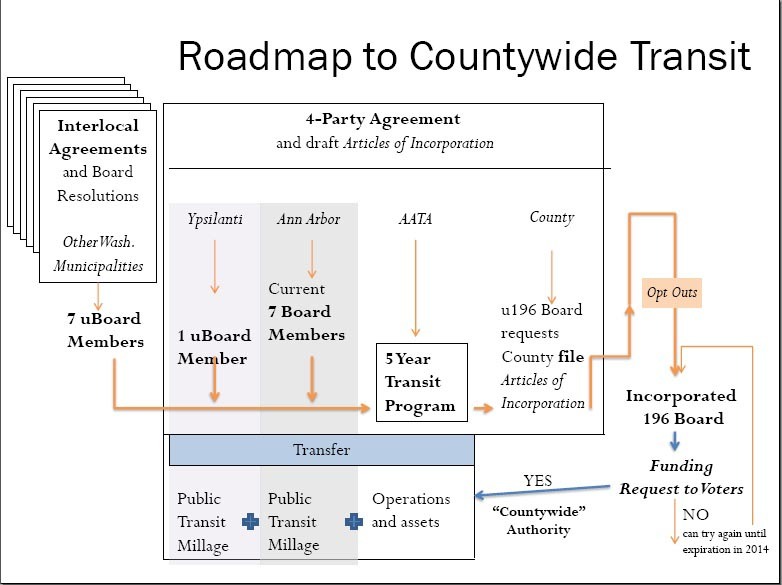 AATA's diagram of the 4-Party Agreement and county authority process. Click for larger. Note that Washtenaw County will be asked to file articles of incorporation for a new authority. That will start a 30-day clock ticking during which any of the townships that have currently signed Act 7 (Urban Cooperation Act) agreements may decide to “opt out” of the county plan. (Currently 4 townships have declined to participate, Lyndon, Sylvan, Salem and Bridgewater.) After the 60 days is over, there is no longer a window for any of the participants to opt out. The new county authority (called the 196 Board because it will be incorporated under Act 196) will be able to call for an election, and is currently expected to ask voters throughout the county (unless in an opted-out township) to approve a millage on a ballot next year. Now, see that box that says “5-year transit program”? That is the package of services that the new authority will be promising to the voters in return for a millage. Because of the limitations of Act 196, only a 5-year millage can be put on the ballot. (Ann Arbor and Ypsilanti have perpetual, or charter, millages that do not require another vote.) The entire TMP (as shown on the Moving You Forward website) is for 30 years. A Financial Task Force has been assigned the task of figuring out how to pay for the services listed in the expansive TMP. But though the slide in the AATA presentation indicates that there will be a “white paper” available in January, in reality the task force is struggling to make sense of the budgets presented to it. The full group will not have had any of its scheduled meetings since the first meeting on October 28. (See our discussion of that meeting and events surrounding it.) A subcommittee has been meeting instead. The members are asterisked below (click on image for larger view). The subcommittee has pinpointed a number of questions that also highlight the priorities given to the different services in the plan. In the next post we’ll enumerate the categories and look at budget numbers. 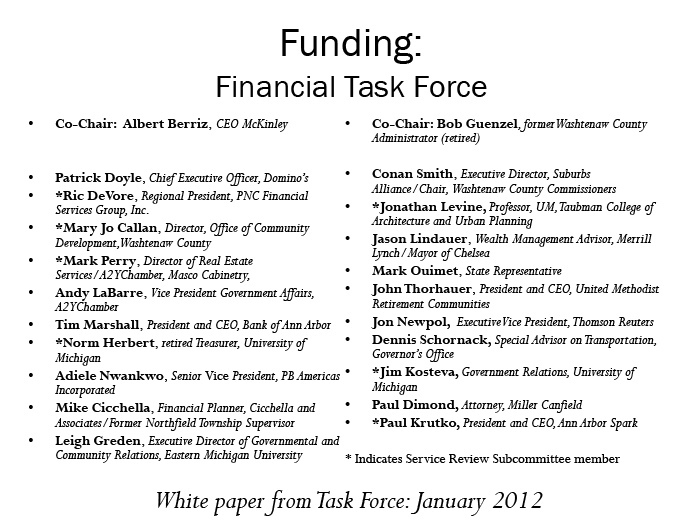 UPDATE: The next meeting of the full Financial Task Force has been scheduled for January 27, 2012. It seems unlikely that it will produce a White Paper in January. This entry was posted on December 12, 2011 at 8:38 pm and is filed under Business, civic finance, Transportation. You can subscribe via RSS 2.0 feed to this post's comments. You can comment below, or link to this permanent URL from your own site. I haven’t seen it covered in the Ann Arbor media, but Detroit Mayor Bing announced a few days ago that the Feds have withdrawn their support for light rail on Woodward in favor of an improved (and far cheaper) bus system. The principal reason cited was the likely inability of the State or City to pay the annual operating costs. This, despite a $100 million commitment from the private sector to fund the construction. Yes, thanks for highlighting that. I plan to discuss the implications in a future post. MI will be a backcountry state until it has efficient, affordable, accessible rapid transit that includes all of metro Detroit & Washtenaw & Livingston Counties. Hopefully Gov. Snyder sees this & can convince the legislature (& Congress?) to think progressively, doubtful given his lack of success moving the US-Canadian bridge project forward. Voters get what they vote for, & our legislature’s agenda is worrisome in terms of transportation. SEMTA has been a major disappointment, for various reasons.